The previously scheduled performances of The Bald Soprano last weekend was postponed due to the sudden illness of one of the actresses. In keeping with the old adage that THE SHOW MUST GO ON, the CTG team has made a remarkable effort in presenting The Bald Soprano last night with Gayle Hendrix joining the cast. Ms. Hendrix demonstrated her skill in beautifully subbing this dialogue rich part—albeit with script in hand. 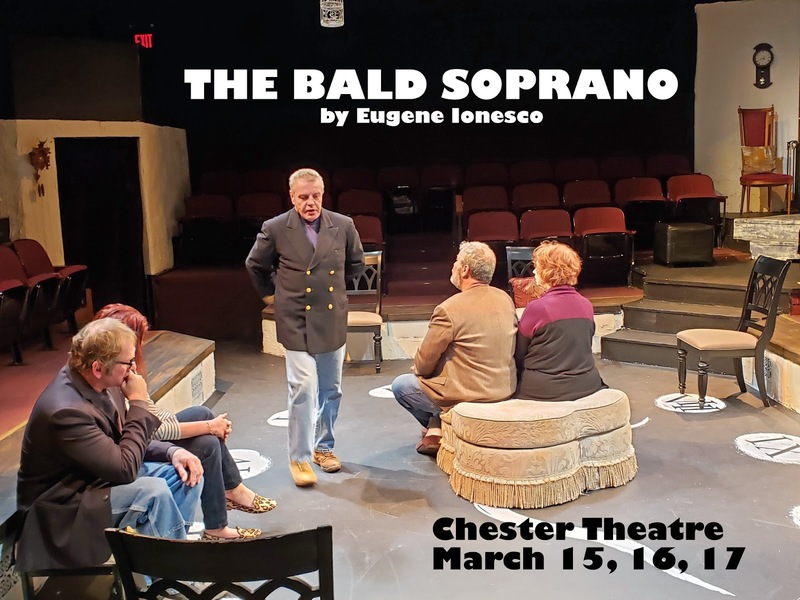 The play The Bald Soprano is not a favorite on the community theatre scene. In fact, it is fair to say it is rarely produced anywhere! The plot? Two middle age English couples, one eccentric maid, and an equally eccentric Fire Chief (the maid's lover) spend a quiet evening in the flat of one couple. Did I say that both couples are also eccentric? Even the Monty Python team would be mystified by the bizarre verbal exchanges. Yes, it IS a comedy, but don't look for any input from Neil Simon. The play is of French origin—La Cantatrice Chauve has been translated from French as The Bald Soprano or The Bald Prima Donna—is the first play written by Romanian-French playwright Eugène Ionesco and was first presented in 1950. Today, the play is recognized as a modern classic and an important seminal work in the Theatre of the Absurd. Please don't dismiss this production because of its quirkiness. It is a fascinating piece of theatre deserving of the attention of true theater fans. It will be generating discussion long after the trip home. If anything, enjoy the marvelous cast. The first couple is the Smiths, Matt Cotton and Gail Hendrix, both CTG veterans, they are a marvelously boring couple. Ms. Hendrix, deserves her own round of applause for stepping in to the part literally at the last moment. She saved the day. At the plays opening, Mrs. Smith is informing her husband of all the things that have happened that evening, even though he was there. Their amusing discussion of a family in which everyone is named Bobby Watson is a comedy highlight. The second couple, the Martins, is not as boring, yet somehow properly English—aloof, dull and quite bizarre. Prime example: Through a process of illogical deduction, they are forced to conclude that they are actually husband and wife! They are played nicely by Keith Beechey and Liza Harris. Beechey is right out of a Fawlty Towers episode. The other two 'lovers' are Lily Boyle as Mary, the maid, she makes dusting into an art, and James Houston as the fire chief in search of a fire. They contribute uniquely to the craziness. The play is a CTG Black Box Production: directed by Rachel Lichter Friden; producer Stephen Catron; stage manager Will Sandoval; and lighting Ellen Fraker-Glascock.